Crewing up for a film shoot can mean hiring for quite a few different positions. Luckily, there are tons of talented members of the film and television industry, at every level, waiting to work with you. So where do you start? What resources are available? How do you find candidates to fit your needs? Are they reliable? Let us guide you. Finding the best crew for your project is the most essential part of pre-production, so we’ll take a good look at the different ways to find and hire the perfect crew to make your next project the best it can be. Your job will be made exponentially easier if you start with your department heads, because once you've found the leader of each department they will take over hiring the rest of the necessary crew members to fill out their department. Line producer or production manager would be the first stop, as they, in turn, will very likely be hiring many of the other positions you need. Start from the top and work your way down. Often times they will have a reliable group they've worked with before. Know before your union status before you look for candidates. This saves the trouble of weeding out those your budget can’t afford. Give yourself a crash course in the positions for which you’re hiring. After all, if you don’t know what, say, the VFX person, DP, or gaffer does, you won’t know if someone can do the job effectively. Referrals are a great first step. Ask around, post on social media, find out if people you know can direct you to qualified candidates. Or, maybe someone you know is a qualified candidate — don't be afraid to ask if he or she is available, or if he or she can guide you to others. Another crucial resource is a production job board. Visit a site like Production Beast and put up an advert for crew positions. In addition to ask friends and contacts and utilizing production job boards, by all means pick up the phone and call up below-the-line agencies if your budget allows. Request reels of candidates who might fit your needs. There are hungry artists and craftsmen everywhere. Whether you’ve received them by referral, agency or through a job board, the resumes and reels will come pouring in by the truck load. The first thing you want to see is experience by medium: features, television, commercials, documentaries, or reality. Next, divvy up by position. A candidate's credits should inform you of their career path to date. For example, PA to 2nd assistant camera to 1st assistant camera to director of photography can be considered a natural progression. A 1st AC should have a reel, whereas a PA shouldn't need one. Second assistant camera might have a reel, but if they don't - make a call. Age and education aren’t as important as work history. When it comes down to hiring a film crew, experience reigns supreme, especially for those key positions. For film and television, quickly verify credits on IMDb; for commercials, check Adweek, and for music videos try the Association of Independent Commercial Producers. Next, what do their references say? Make sure to ask some specific production questions to the references so that they can give you a sense of their level of comprehension as well. While you compile all of these resumes, you can streamline your hiring process by placing your short list candidates into a contacts list. 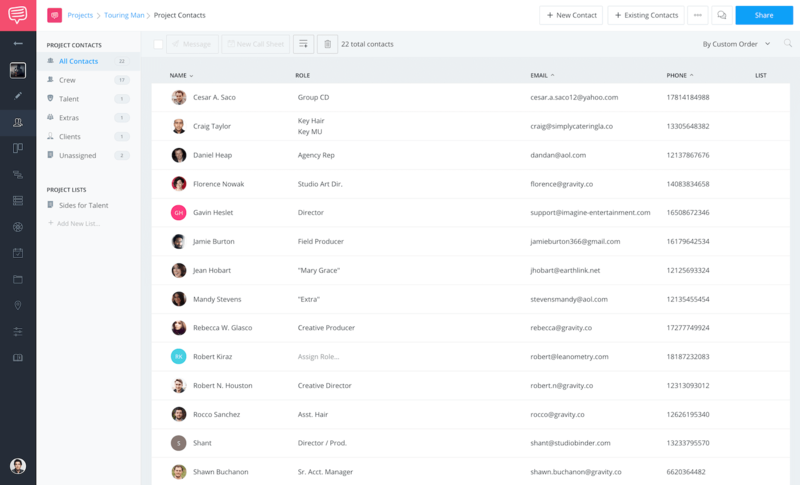 If you happen to hire someone who drops out right before your production, you can always go back and find the other candidates in your "candidates" list in your productions contact list, and that will make life so much easier. Also, if you're a production company that does projects on a week to week basis, you can keep a rolling roster of creatives to call upon whenever you need. You're trying to make a short list - and if you get a really great DP that already has a team - you won't have to worry about the camera department. Prepare questions that will get concise and honest answers. How would you handle a missing piece of gear? If we're running behind, what is a technique you use to get us back on track? You should have a basic understanding of the duties yourself. Ask if they have any question. Be prepared to answer questions about shoot dates and anything else you already have established in your production plan. Some crew members will have multiple offers, and that is fine. Don't make promises or try to convince anyone. If they want to come onto your project, the chance that they will be a pleasure to work with is much higher than someone you "had" to convince. Film crew interviews are very similar to regular interviews, except that many of more of them are done over the phone because of time constraints. That means you can't gauge the same things you would in a normal interview, and that is why it is so nice to get a reliable department head that will take over hiring the crew in each of their departments. You may be interviewing the department heads, and chances are that you will have to speak with these people on a day to day basis. Make sure they are a pleasure to work with, because at some point things are going to become more difficult than you would like them to be, and you need to at least have a decent relationship with that person. Watch their reels with them, and have them tell you bits about their creative decisions and how they were able to achieve certain things. This is a neutral question so it doesn't offend, and may give some insight. You can also get a few helpful tips from candidates that may not even come on board - and this is a way for you to boost your production effectiveness. For instance, if hiring a production manager show them a budget top sheet and ask them to present a way to save on the budget, time or crew. The answers will be varied and insightful. Don’t forget to ask some fun questions. See them at their best, and give them a reason to bring their best. If you're hiring a crew, you probably have a team around you that can help you sort your candidates and that will happy to give input. Start by sharing their resume, reel, and portfolio with the person you’ll get for the second set of eyes. Make sure they know what you are looking for. You can even give them a copy of the questions (and answers) that you’ve asked. Ask them to comment on the strengths and weaknesses of each and then have them rank the candidates in the order they like. Or, have them list the pros and cons of each. Now, you do the same. This seems shallow, and maybe it is, but I've worked with crew who were nightmare human beings on set, and crew who were absolutely lovely. Both brought the same quality of work. If you're hiring a crew, don't let yourself be tricked into thinking that because someone is arrogant and has a bunch of credits means that the quality of their work will be worth the poor attitude they bring onto set. I'm not saying you need to hire someone with minimal experience because they know how to treat people with respect, but you will have to deal with these people at the very least for a day, so help out the good people first. Email those who don’t get the job and thank them for their time and energy. Though this will be a form letter, some sincerity is appreciated. Now you know how to hire crew. Why not sharpen your own skills, and learn some helpful tips on how you can also become a better producer. Good information. I especially think it’s important to follow up with folks you didn’t hire as you may need to call them again and they won’t necessarily be keen on working for someone who ghosted them previously. Thanks for this advice for finding a good film crew. I’m glad that you mentioned you should try to find your department heads first. I wonder if it could be good to also see if the department heads use similar technology or managing software, especially if that could affect how well the rest of the film crew will communicate and work together.